In a time of superstition and fear, Elouise hides a powerful secret, one that will set her on a path of tragedy and revenge. Originally published in Andromeda Spaceways Inflight Magazine – issue 54 – as Lex Talionis . A few years back, I was watching a terrible teen movie about a bunch of dudes with magic. It’s only redeeming features where the eye-candy and a rather chauvinist plot device that meant only men could wield magic. Now, that last part isn’t normally a good thing, but in this respect, it ticked me off so much that I came up with the idea for Tales of the Light. 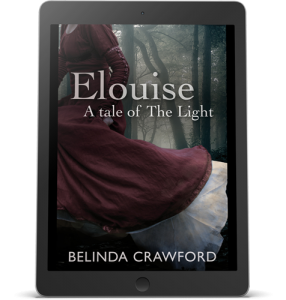 I won’t tell you any more about it, except that Elouise is the prologue of a longer story. Although it’s not my on writing calendar just yet, Tales of the Light is definitely a project I’m keen to get back to. Cover design credits. Model courtesy of faestock. Background image courtesy of StarsColdNight, xKenren & needanewname.